5.0 x 3.6 x 3.3 in. 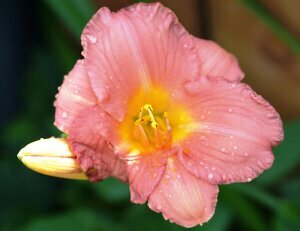 Some cameras are all about cramming in features; the Sony A3000 doesn't play that game. It's been pared down to the basics -- you get precisely what you need, and little more. But while rivals in its pricetag skimp on the basics with plastic lens mounts and years-old designs, Sony plays its own game, making an affordable camera that you'd actually want to own. But that's not to say that there are no compromises in the A3000. Read our in-depth Sony A3000 review, and find out whether Sony's hit the perfect balance between features and cost! Available since early September 2013, the Sony Alpha A3000 carries a list price of just US$400 -- and that's with an E 18-55mm F3.5-5.6 OSS stabilized kit lens included in the bundle. For step-up buyers, the lower pricetag means money back in their pocket, or spent on their first system accessories. Since Sony launched its first mirrorless cameras -- the Alpha NEX-3 and NEX-5 -- back in early 2010, its E-mount has gone on to become extremely popular. Now that Alpha mirrorless models have been around for several years, though, the company finds itself faced with a question. Almost two thirds of step-up buyers are still opting for an SLR-style camera instead of mirrorless. Something more along the lines of what they see the professionals using, in other words. How can it bring them to the E-mount? The answer, it believes, is the brand-new Sony Alpha A3000. And like a NEX camera, the A3000 forgoes both the bulky, expensive mechanical mirror system found in most SLRs, as well as the Translucent Mirror system found in Alpha SLT-series models. By ditching these, Sony has been able to pare pricing down to a new, even more affordable low. Even though it lacks its predecessor's Translucent Mirror and Alpha lens mount, the Sony A3000 is essentially a replacement for the now-discontinued Alpha A37. It forms the new entry-point to the Alpha A-series line, after all. As the first A-series camera to feature an E-mount (and conversely, the first E-mount camera without NEX branding), there's doubtless going to be a little confusion as to just where the A3000 fits in. But any grumbling about the confusion is given a firm answer when one looks at the pricetag. The new model offers a strong challenge indeed when compared to the entry-point into rivals' product lines. And it's worth noting that here, we're talking about older models such as the Canon T3 and Nikon D3100. Both have been on the market for a long time, and now list for well below their original pricetags at launch. Yet Sony's much newer model is noticeably more affordable than both. The gauntlet in a brand-new entry level price war has just been thrown down. Let's take a tour of the new model. The Sony A3000 eschews the angular, slightly ungainly styling of the A37, in favor of a rounder, gentler aesthetic that's more similar to the company's other Alpha-series models. It's definitely an entry-level model, though: the first thing you'll notice when you look at the front of the camera is that there's no front dial beneath the shutter button. What you will find is a nice, chunky grip that's sculpted to fit your hand, alongside the Sony E-mount that previously had been found only on NEX-series cameras. 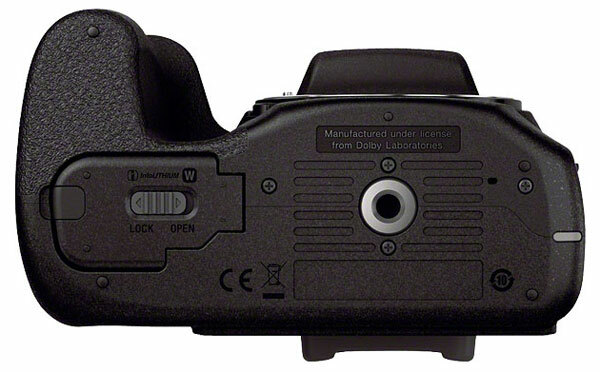 At top right of the mount (as seen from behind) is an LED lamp for autofocus assist. Jump to the top of the body, and things are again very straightforward, as you'd expect in an entry-level camera. The leftmost end of the body is featureless. At center, there's a popup flash strobe and Multi Interface Shoe for external strobes, and between them sits a stereo microphone. A control for switching between the LCD monitor and electronic viewfinder sits just right of the popup flash, and you will certainly be using it, as the entry-level pricetag doesn't allow for the sensor used to provide automatic switching on pricier models. The only other top-deck controls are the Mode dial, Power lever, Shutter button, and Playback button. On the rear of the Sony A3000, you'll find the interface of a Sony mirrorless camera, rather than that typical of a Translucent Mirror model. At right of the three-inch LCD monitor are two soft buttons, split by a combined Four-way controller and Control dial, with another soft button at its center. As in the NEX cameras, the functions of the soft buttons change with operating mode, and are indicated on the adjacent LCD panel. And as you'd expect given the pricetag, the LCD is neither articulated, nor does it feature touch functionality. 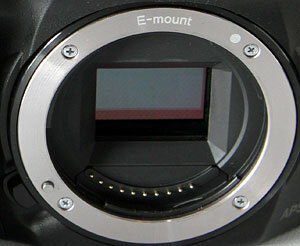 Near the top right corner sits a Movie record button, snugged up against the electronic viewfinder and the top right corner of the LCD. Two final controls can be found on the leftmost end of the Sony A3000's body. Directly above the screen-printed Alpha A3000 is a button used to deploy the popup flash strobe. 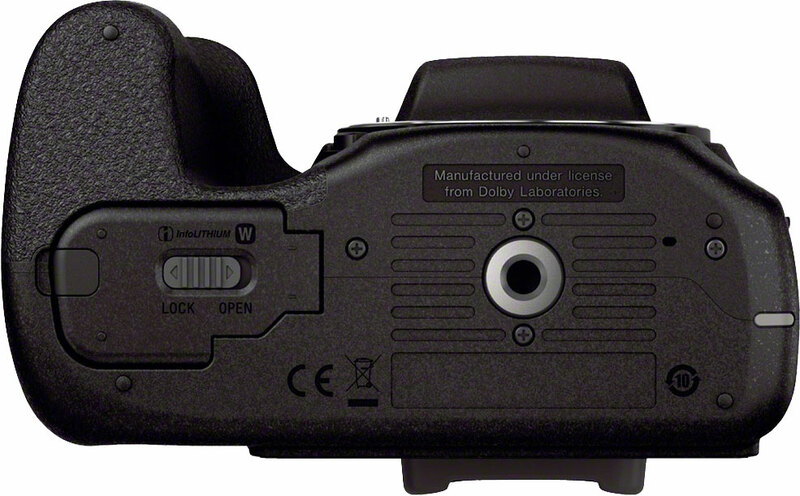 There's also a small dial on the side of the electronic viewfinder, used for a generous -4 to +3.5m-1 diopter adjustment that will let many eyeglass wearers shoot without their glasses. You'll also find a lug for the left side of the shoulder strap. Beneath this, most of the left end of the body is occupied by a large compartment door. Behind the door, you'll find the Multi terminal and a combined Secure Digital / Memory Stick Duo multi slot. The right side of the Sony A3000 is featureless, save for a shoulder strap lug, mirroring that on the left side. And finally, the bottom, too, is largely featureless. At the base of the handgrip is a compartment door for the InfoLithium battery pack, complete with a small cutout that allows ingress for the optional AC adapter kit's dummy battery cable. There's also a tripod mount, nicely positioned on the central axis of the lens. What makes this affordably-priced SLR alternative tick? Sensor. At the heart of the Sony A3000 is an EXMOR APS HD CMOS image sensor with an effective resolution of 20.1 megapixels. Total resolution is 20.4 megapixels, and the APS-C sized chip has a 3:2 aspect ratio. Unlike Sony's DSLR and SLT models, though, the sensor is not stabilized, as the A3000 supports only lens-based optical image stabilization just like NEX models. Performance. Sony doesn't specify the image processor used in the Alpha A3000 beyond that it's a BIONZ-branded chip, but as you'd expect in such an affordable, entry-level camera, performance is modest. Ordinarily, the A3000 will capture just 2.5 frames per second, but if you're willing to lock exposure and focus from the first frame, this can be increased to a still-sedate 3.5 fps. Burst depth is 13 frames in JPEG mode, and drops to just five frames if you add raw files. Click to read detailed Sony A3000 technical information! Have the tech mavens and marketing gurus at Sony finally managed to deliver a high-performance APS-C-format DSLR -- complete with stabilized 18-55mm zoom kit lens -- for the truly astounding price of US$300? (Street price as of this writing in June 2014.) Well, that all depends on how you define a DSLR, and whether you're willing to put up with the inevitable compromises that have gone into designing this ingenious entry-level camera. The A3000 is aimed primarily at folks stepping up from point-and-shoots and (dare I say it?) cell phone cameras, who are likely to be attracted to its DSLR form, functionality and interchangeable lenses. It's really more of a mirrorless compact like a Sony NEX, though, dressed up to resemble a Translucent Mirror "SLR" like the (now discontinued) Sony Alpha A37. Still, with a high-resolution 20.1-megapixel Exmor APS HD CMOS image sensor coupled to a BIONZ image processor, Full HD (1080p) video capture at 60i or 24p, plus features such as HDR, Dynamic Range Optimizer and Sweep Panorama, it might tempt an enthusiast -- especially one who already owns an E-mount mirrorless camera. And it even accepts Sony Alpha-mount lenses via an optional Sony LA-EA2 Adapter ($400 list) which adds phase-detection autofocus to the camera's 25-point contrast-detection AF system. Want to know if the affordable Sony A3000 is right for you? Find out in my Field Test! Does the affordable SLR rival hit the right balance of price vs. features? Some cameras are all about cramming in as many features as possible, even if you'll seldom use them. That's great for the belt-and-suspenders types, but it makes them much more expensive than they need to be. The Sony A3000 doesn't play that game. This is a camera that's been pared down to the basics -- you get precisely what you need, and little more. But boy, does that approach ever pay dividends when it comes time to fetch your wallet. For a list price of just US$400 -- and at the time of this writing (June 2014), street prices without rebates are below US$350 -- you're getting an extremely high-res, SLR-like camera with great image quality, and a stabilized kit zoom lens to boot. Sure, it's not a true DSLR, but the lack of a reflex mirror means one less mechanical part to fail, and it makes the Sony A3000 quieter to shoot with, as well. And while this is clearly an entry-level camera, Sony has somehow managed to buck the typical cost-saving strategies where it really counts: There are no plastic lens mounts here. Both body and lens have metal mounts that will help this camera last. Want to know our final verdict on the Sony A3000? Hit the link below!